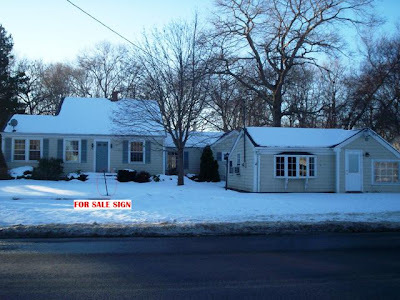 Note the for sale sign on the property, the lack of Butler's signage on the former donut shop, and the unplowed parking lot. 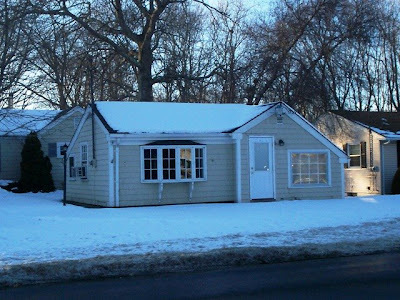 It is now just an abandoned building on Sanford Road - far from the Westport hotspot that it used to be. Come back, Butler's! Your fans miss you! It seems that an era has ended. 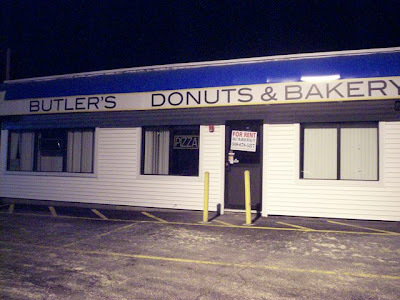 Yesterday, while heading to the Somerset Stop & Shop, Mom and I drove past Butler's Donuts on Route 6. Their large sign was off, but we didn't think much of it because of the impending snowstorm. Perhaps everyone had already gone home? WRONG! 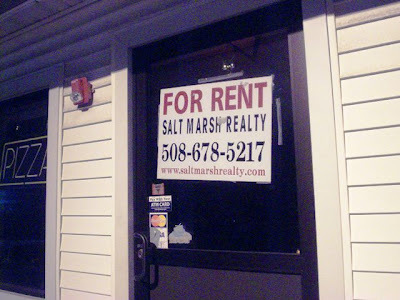 As we continued on, we spotted a "For Rent" sign in the window. "Turn around," screamed Mom, not caring that the rest of Somerset was on a bread-and-milk alert and would probably frown upon me stopping traffic just to check out an empty donut shop. Either way, I managed to cut across two oncoming lanes of traffic and pulled into the empty Butler's lot to take the pictures you see below. Now, Mom and I already knew of the original Westport location's closing. The quaint little shop has been boarded up for months with signs on the windows instructing patrons to visit the Somerset location. Since our family loves a good long john, we've been pretty faithful in visiting the Somerset shop to acquire this dessert. However, more often than not, they were not available. It was always something like, "We don't have anymore cream," or, "We didn't make any today." What's up with that? Isn't that why the new owner bought the secret donut recipe for thousands of dollars? Why wasn't he using it? That recipe put Butler's on the map! About two or three weeks ago, Mom and I drove past the Somerset location and talked about getting a couple of cannolis. Now that Butler's seems to be gone forever, it's a shame that we didn't have one last chance to visit and attempt to get some of their famous cream pastries. I doubt that buying a couple of donuts would have saved them from closing the place down, but at least we could have had a little memorial service for the donut that will always be one of our all-time favorites. It's a shame that this area will now be void of Butler's Donuts for good. The long johns and the cream donuts made at Butler's Colonial Donut House are to die for. After reading about them on a few dining Web sites a few years ago, we decided to try them for ourselves. Trust me, you have never had a cream donut until you've had one of these. They are delicate, rich, cool, fresh, and have a knock-your-socks-off kind of taste. Since the new Somerset location had run out of both long johns and creams on Saturday night, Mom and I decided to stop by the original Westport location today to pick some up. We pulled into the small parking lot of Butler's at around 1:15 p.m. Butler's looks more like a tiny home than a bakery. With about six parking spaces and barely room to stand, early morning customers often have to wait in line to get in. Since we had arrived closer to closing time, we were able to go right inside. The owner was there and was waiting on two older gentleman who were ordering donuts. While he was busy with them, I was able to take some pictures of the interior. When you walk through the door, you are automatically facing the cash register and bakery display case. To the left is a soda and milk case and an area where coffee is served. Behind the display case is their baking equipment. It looks sort of old fashioned, but they really can't fit any large equipment in the small space. Butler's is always very clean when we visit, and the smell of the fresh baked goods is intoxicating. When it was our turn to order, Mom asked the owner if there were any long johns and cream donuts available (since she didn't spot any in the display case). The owner said yes, and proceeded to fill some freshly made donuts just for us. He jokingly mentioned that Mom and I were taking a chance by visiting Butler's so late, and he was right. Usually the long johns and cream donuts sell out very quickly, but Butler's always tries to make sure that they save some donuts and filling for latecomers like us. 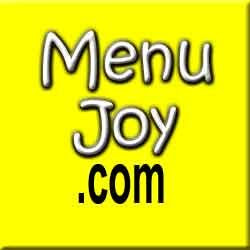 Mom had ordered four long johns and four cream donuts ($1.30 each; 1/2 dozen - $7.25; dozen - $14.50). Other pastries include their regular donuts (75 cents each; 1/2 dozen - $3.99; dozen - $5.99), Napoleons ($2), real cream horns ($1.85), whoopie pies ($2.50), bags of cookies ($2.50), scones, eclairs ($1.85), French meat pies ($2), chourico rolls ($2), stuffed quahogs, and Willow Tree chicken salad rolls ($3.60). As Mom was paying, I asked the owner what the hours for the Somerset location were. Unfortunately, not only were we unsuccessful trying to get our cream donuts on Saturday, I was unlucky again on Tuesday because both locations were closed. He politely wrote down the hours on the pastry box for us. As we were leaving, a frantic older woman rushed in and asked the owner if he offered any sugar-free pastries. I don't know how that turned out, but the owner seemed more than willing to help the customer with her question. When we got home, I made sure to take a picture of the donuts before they were annihilated by my family. We put them in the fridge right away, but about an hour later both Mom and I were ready to eat. The long john, which is covered in granulated sugar and filled with both the real cream and a blackberry jam stripe, was outstanding. The cream donut, which is covered in powdered sugar and stuffed with nothing but the cream, was just as amazing. It is no wonder why these donuts have been featured in so many newspapers and gourmet magazines. They really are the best in New England. Butler's Colonial Donut House in Westport is open from 6 a.m. to 3 p.m. Wednesday through Friday, and 6 a.m. to 5 p.m. on Saturday and Sunday. They are closed on Monday and Tuesday. Hoping to get some long johns and cream donuts, Mom and I stopped at the new Butler's Donuts location in Somerset at around 5:45 p.m. Unfortunately, they were all out. It's hard for us to believe that the former Steve's Downyflake Donuts is gone, but we're glad that more people are now able to taste the fresh cream donuts that makes Butler's so famous. The parking lot is very small, and it is on a very busy street. I believe there is a drive-thru window at the back of the building, which is also very small. When you walk in, you are greeted by many loaded bakery display cases, which is very appealing to the eye. There is also a rack for breads and scones, and a cooler containing bottles of milk, juice, and other drinks. Everything is painted white, which gives the bakery a very clean look. The girl behind the counter was very polite and apologized for not having the long johns or cream donuts. She mentioned that a lot of people had come in asking for them. Mom chose what she wanted - two cannolis, a large whoopie pie, two lemon squares, and two brownies (one with nuts). This Butler's also has deli sandwiches available, as well as the standard pastries, fritters, Napoleons, and real cream delights that you can find at the original location. The cashier began talking about a magician that had just come into the store before us and had been doing magic tricks. I spotted a balloon animal near the cash register and she told me that he had made that for her. I'm sorry I missed that! The total came to $9.30. After Mom paid, the polite cashier told us to stay dry (it was raining very heavily on Saturday). We left Butler's and decided to park somewhere and have a cannoli. These cannolis are one of our favorites. Mom loves how the crust is neither too crunchy nor too soft, the cream is not too sweet, and that the chocolate chips at each end give the cream a little crunch. The next day, the other pastries were tasted. The lemon squares were very good. We love the nice, flaky crust and the lemon filling is not too tart. However, both the brownies and the whoopie pie were a little dry. Mom said the cream in the pie was very good (not sweet), but she was disappointed that the cake wasn't very moist. I felt the same way about the brownie (with nuts). It could have been more moist. However, the taste was good. All in all, we love Butler's Donuts. Although the long johns and the cream donuts are what they're known for, we love their cannolis and we can tell by the empty pastry trays that the other goodies are flying out the door as well. This is definitely a New England gem. Butler's Donuts and Bakery in Somerset is open from 7 a.m. to 7 p.m. Wednesday and Thursday, 6 a.m. to 8 p.m. Friday and Saturday, and 6 a.m. to 6 p.m. on Sunday. They are closed on Monday and Tuesday.